One of our premium (costs more money) options, allows people to start the subscription process for your mailing list using our input form and servers. The webpage form will look something like this on your web site. You may change the words, to anything you want. We will send you a snippet of HTML to paste into your web site, when you turn this option on. You may need your webmaster to help you with this. CGI stands for Common Gateway Interface aka the webpage form. If you want to use our CGI, choose this option. Our CGI places a subscription box on your web page, and simply emails a subscribe/unsubscribe request to your list with their email address in the "From" line. When you click on these options, you can enter the webpages where you can display your custom message to your subscribers. 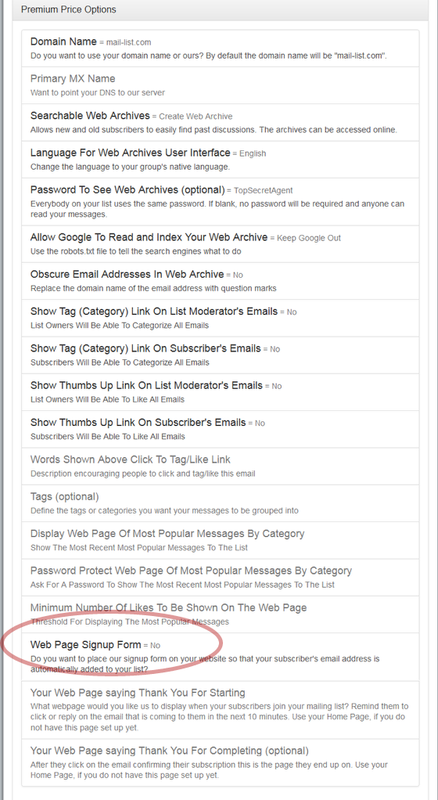 If you don't have these pages setup yet, just enter your website's home page URL. 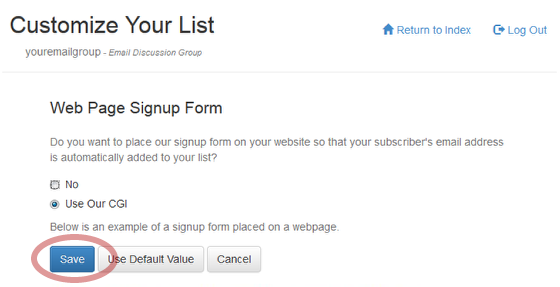 A welcome message is sent to the subscriber by email that will advise them of their subscription to your list. Prev: How do I check if a subscriber is on my list? Next: How do I control where Replies to our List Messages Go ?